Do you make quiche, or buy it? What about the crust? Sometimes I order quiche at a French café, though I don’t buy it prepared at the store. It’s just one of those dishes that I make, or order. The crust is more like a 50-50 situation: half the time I make it, but many times I use one from the freezer. 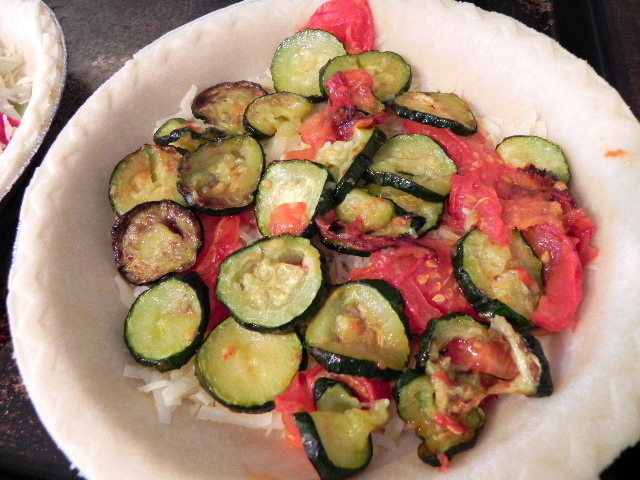 And if I’m going the pre-made-crust-from-the-freezer route, I always make 2. It’s just as easy to double up and have 2 types for dinner (or lunch) once you’re preparing, anyhow. Often I make one with onion or leek and potato, because we always have those in the kitchen, and another with whatever fresh ingredients are in the fridge. But when I’m adding vegetables, I usually like to roast them first. 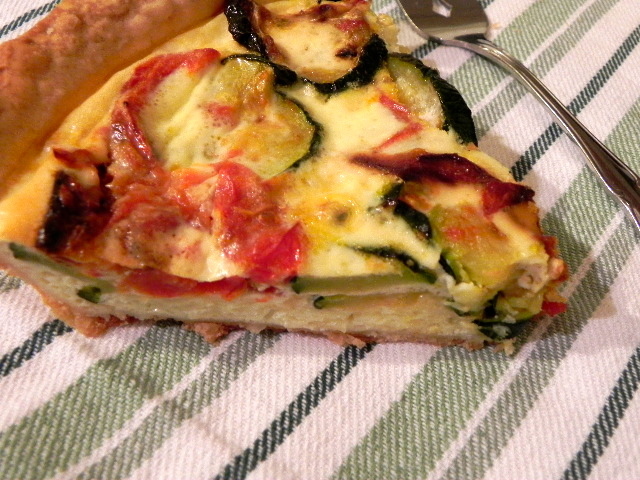 Think about it: tomatoes and zucchini tend to make your quiche water-y if you don’t cook them first. Mushrooms and eggplants will taste more flavourful if they’ve been roasted a little. Sometimes I add jarred marinated mushrooms or sundried tomatoes, but drained and patted with a cloth so they won’t be wet and oily. There’s always some cheese included (a combination of whichever strong cheese is in the fridge), and a mix of cream and milk. And a handful of chopped fresh herbs, if I have some. With a bright salad and some bread, there’s dinner. Or it’s nice alongside soup, too. Loosely fill the 2 frozen pie shells with chopped, sliced and shredded assorted fillings, according to what you have and what you like. If you go heavier on the vegetables, as I do, you’ll need 6 large eggs + 1 cup 10% cream + ½ cup milk. Beat the eggs / cream / milk together and pour into the otherwise filled 2 pie shells. Bake at 375 for approx. 40 minutes.